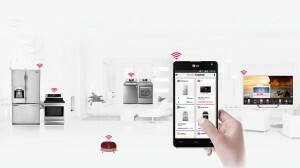 LG has announced the new generation of advances in smart technology that will be presented next January at CES 2014. 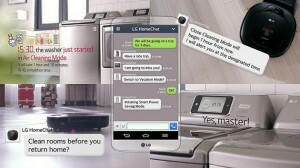 LG uses the ‘Natural Language Processing ‘ (NLP) to communicate the home appliances with HomeChat and LINE. The company has decided to use HomeChat with LINE to facilitate learning users. LINE has over 310 million users and is available for all mobile platforms: Android, iPhone, Windows Phone, BlackBerry, and Nokia Asha; and it’s also available for computers with Microsoft Windows operating systems and Mac OS X. Users will be able to control their home with simple commands. A message style ‘I’m going on vacation,’ will put the fridge in power save mode, order the robot vacuum to clean every day at 9 am, and set the washing machine to run a wash cycle the day before our return. Among the many features available, we have a complete food storage system. With HomeChat , we can check the provisions of our LG refrigerator from anywhere, control the expiration dates of various food and even receive suggestions on possible recipes that we can prepare according to the provisions available in the fridge. Similarly, the smart oven may also suggest recipes. So when we choose one, it just set the appropriate time and temperature to cook the dish selected. The app from smart oven keep us updated with the latest recipes available. Through HomeChat, we can also change the washer programs, adapting them to our personal uses. In the same way, we can start the washing machine, monitor its status and receive alerts when the program ends. Finally, another interesting feature of the service is the Tagging and Smart Diagnosis via NFC. This service allows us to solve some problems of the devices without asking for a technician to come. It will be initially available in Korean and English, but LG has already announced more languages to come.